Live action and animation have a long history of being presented within the same form, from 1964’s Mary Poppins to 1988’s Who Framed Roger Rabbit? and 1996’s Space Jam. These films are far from monolithic, yet the two forms are often viewed as diametrically opposite and when they are combined it is often viewed as either transgressive, questionable, or childish. I’ll explore this synthesis in Baz Luhrmann’s The Get Down and in Zachary Heinzerling’s documentary Cutie and the Boxer. This was the case in the second season (Part 2) of The Get Down, a music drama which depicts the emergence of hip-hop and the death of disco in 1970s New York. Animation is incorporated into the larger plotlines as a means of speeding up certain elements of the storytelling, as well as focusing attention on other details. The animation brings us up to speed about certain details that have transpired between parts one and two, off screen and materialises them on screen via animation. While the live action majority of this series is undoubtedly a story being told to us, the storyteller is either unseen, i.e. the writers of the show, or presented to us in a flash forward to the central character, of Ezekiel, rapping about his life to a large audience, following his mainstream success as an artist. However, the animated parts are presented to the audience as a story being told in real time by the character of Dizzee, played by Jaden Smith. Dizzee, a graffiti artist and a part of the music collective ‘The Get Down Brothers’ depicts their adventures through comics, which he draws for Thor, a boy he met whilst graffitiing. Throughout the first season the love story between them is one based predominantly on implication, apparently to recreate the means of storytelling used in depicting queer relationships within 1970s and 80s film canon. Yet, in making these comics for Thor, the depth of Dizzee and Thor’s relationship is shown, and though most of their relationship exists in the there-ness of what we can’t see, the comics make evident the attention they wish to give one another. The show takes place in 1979, just before the AIDS crisis. Their love is sweet and exciting, and there is no echo of danger outside of periphery homophobia. From fans, there was some pushback against the animated portions of the show, saying they were too long, distracting and the worst part of the series. I will admit that a part of me did want to get back to the more dramatic live action portions, as much of the animation was exposition, however I was thankful for it in how it framed further scenes. Be that scenes between other characters, or between Dizzee and Thor. The animation leaves no doubt to the mind of the viewer that Dizzee and Thor are truly close, it creates a space of being okay with the fact that most of their relationship exists off screen, but that just because we don’t see it doesn’t mean it doesn’t exist. These animated sequences make it clear that Thor has been on Dizzee’s mind, as when Dizzee performs with the rest of ‘The Get Down Brothers’. While high on badly cut angel dust, he imagines he sees Thor, who asks him, “Have you ever been in love?” Dizzee replies, “Once.” “How’d it end?” “It hasn’t.” before collapsing, while the non-imagined Thor tries to help him. The animation propelled the emotion forward, making this scene seem natural in their timeline, even if it was imagined. To stay with a similar idea of animation depicting emotional truths within live action, I will now move onto the 2013 documentary film Cutie and the Boxer, directed by Zachary Heinzerling. ‎ Cutie and the Boxer depicts the present lives of artists Ushio Shinohara (the Boxer) and Noriko Shinohara (Cutie), based in New York City, as well as takes a retrospective look on their artistic careers and personal lives. Ushio creates art by punching paint on canvas with boxing gloves, where, Noriko, who had always an artist, sacrificed her own artistic endeavours to raise their family. Twenty one years Ushio’s junior, she speaks on gender roles, the nature of such an age gap in a romantic relationship and how he was naturally more established as an artist when they met. Now older, she seeks to create her artistic identity on a larger scale. She has helped Ushio throughout their relationship, but she makes clear that, “I’m not his assistant, but sometimes I help.” Ushio replies, though good-naturedly, “because I’m a husband!”. 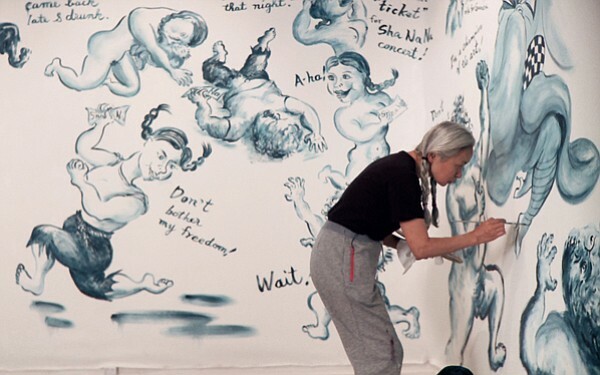 It is the animated sections of this film where Noriko’s artwork is exhibited, as the animated expressions are of her own drawings. Noriko speaks of how Cutie started out as being mostly based on her relationship with Ushio, his character in her drawings named ‘Bullie’. Cutie is the protagonist of her tales, and she paints a nuanced depiction of her relationship, one both of fantasy and based in Noriko’s own reality. It is also notable that the documentary itself puts Noriko’s work before Ushio’s in the title. ‘Cutie’ is also a name she gave her own work, whereas ‘The Boxer’ was a title put onto Ushio, as his work extends beyond his boxing. This makes it evident that there is a power to be found in self-naming. In her work, she isn’t afraid to make you dislike Ushio, and, by extension, some of her life decisions in supporting him so much, but as Ushio asks her, “Cutie hates Bullie?” Noriko replies, “Cutie loves Bullie so much.” That explains it. That is what is at the heart of her drawings, that they are about Cutie and Bullie’s relationship, be they about the negative as much as the positive aspects. He is depicted as volatile, yet still worthy of her love, even if we wished he loved her better. Noriko’s work creates a nuanced depiction of personhood, the artist and gender, as framed by a lifelong relationship. This section of the documentary is undoubtedly Noriko’s, as her relationship with Ushio is shown from her perspective, as well as other aspects of her life and art. The synthesis of live action and animation in the one art form is one which excites me. Not only does it add another physical dimension to the piece, creating intrigue and beauty in a new way, it also explores an honesty within the constructed reality of animation. It gets at an emotional root, perhaps only hinted at by the live action, which otherwise may have played out as too explicit in the live action format.